I now have the 1980 S.H.S annual report but unfortunately there isn't anything reported from this Expedition for some reason so I can't add the usual leader report etc. What I do have however, thanks to Ben Buxton, is a set of the circulars sent out by the leader Nick Deeley prior to the trip. These do at least contain a list of Expedition Members so maybe someone in the future will see their name and be able to contribute something! The photos that were here have been moved to Mingulay 1984 where I think they belong. Not sure about the one below - could be either expedition but matters less as there are no people on it to recognise. 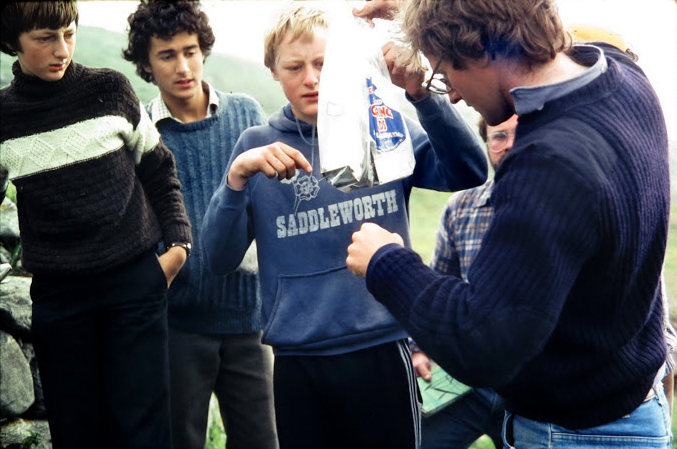 Left - Is that Graham Schofield (same jumper as #5 in group photo above) and Steven Walker in the Saddleworth top? I think that the following three circulars give a very good indication how well the Expeditions were run- although quite a lot to read through. I will find somewhere to store most of the scanned documents on file but for the moment if you want to see something not on here ask me. Firstly welcome to the Mingulay expedition 1980. This circular is the first of three which you will receive between now and the summer. They will contain a great deal of important information which you should note carefully. If after reading them you still have unanswered questions, please do not hesitate to contact me directly. The island of Mingulay lies about half a mile north of Berneray, the most southerly of the islands making up the Outer Hebrides. It is only a small island (2¾ x 1½ miles) and is uninhabited. Although small the island is amazingly varied. On the east is a large bay of beautiful white sand covering over 48 acres at the head of which are the ruins of the old village. Just above this are flat fields where we shall be camping and a good stream close by. Surrounding, the bay are three hills. the highest of which is Carnan, 891 feet high. The west coast is very different from the east indeed. It is made up of very many cliffs which are often sheer and very high. The highest is Biulacraig, and is over 750’. It is very difficult to imagine anything that high, but, if you look outside and find a tall tree (say 50’ high) Biulacraig would. be as high as 15 of those trees one on top of another. Go on try it. The island is owned by local farmers on Barra who use it to raise sheep: but apart from the 1000 or so sheep there is a great deal of other wild life there, firstly there are rabbits - hundreds of them - and it is possible that rabbit pie may appear on the menu occasionally. The island also has a large bird population. Over 1% of all Britain's seabirds nest on this tiny island, arid you will undoubtedly see Puffins, Kittiwakes, Fulmars, Cormorants, Shags, and possibly Razorbills and Guillemots. In addition there are of course thousands of gulls and many other common birds. However there is also a good chance of seeing some birds of prey. Past expeditions have seen Golden Eagles, Peregrines and young, Buzzards and Kestrels. In addition Mingulay is a common stopping place for birds on migration route and you will commonly see huge flocks of rock and meadow pipits, twite and wheatear, just popping in for a short stay. My favourite bird is definitely the Puffins. Unlike many other places Mingulay has thousands of them. They sit quite tame on the cliff ledges or on the sandy slopes, and you can get quite close to them. When we are there they will be nearing the end of the breeding season. They nest in old rabbit burrows and lay a single egg deep underground. In July the chick will have hatched and will be almost large enough to leave the hole. Until now the parent birds have been feeding it small fish brought in to the hole, but will desert it shortly, so that driven out by hunger, the chicks will emerge at night and flap down the slopes to the sea. If we are lucky we may see this happening, as curiously they usually emerge together. Interestingly the numbers of puffins had been falling, but Mingulay like a few other sites now has a growing population, No one is really sure why this should be, hut some scientists think that the reason is connected with the fact that the seas round the islands are getting cooler and more food is available for puffins to feed to their young. You will see from the enclosed timetable that the expedition runs from Tuesday 22nd of July until Tuesday 12 August, but that we do not arrive on Mingulay until two days after that first date and leave two days before the second date. Clearly getting to the Outer Hebrides is a slow business. This is what will happen. Firstly you fill in the enclosed travel form and return it to me. On it you must state which is your local railway station and where you wish to join the main party train. The SHS will then book all your rail, steamer and boat tickets, and send you the bill later. Rest assured that we get large discounts from British Rail and that this saving will be passed on to you. The train terminates in Glasgow Central station, and the whole party then moves to Glasgow Queen Street Station where we catch another train to Oban. At Oban we pick up the food and equipment for our expedition and board a large brand new ferry boat, the 'Claymore’ and set sail for the Outer Hebrides. The journey takes over five hours, and we arrive on Barra at ten to seven in the evening. On Barra the local school has been good enough to put us up and the following day we again set sail for Mingulay itself. This time the journey will be in a 50' boat 'The Boy James’ specially chartered for our expedition. The journey should take about an hour and a half and we will be on Mingulay by lunchtime. Once we have landed however the island is ours for 17 days, and just as soon as we have moved all the food and equipment round to the camp site and have the camp set up then you will be able to explore the island to your heart's content. All these arrangements are quite tricky to make and it is important that you fill in and return the travel forms to me no later than May 7th. As far as sleepers are concerned, I would recommend that if you are travelling from the South of England then these would be a good idea, on both the outward and return journeys. If you live in the North, I will leave the decision up to you. There is no need for berths on the ferry. Please note that once you have filled in the travel form, there is nothing else for you to do. Do not purchase tickets yourself if you fill in a travel form. 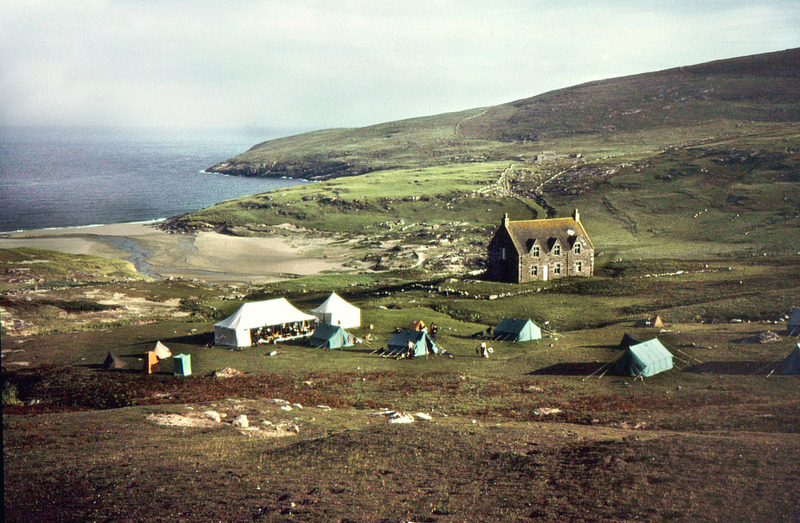 Accommodation on Mingulay will be under canvas. We will have two large marquees, one for storing food and the other for cooking and eating in. You will sleep in large (13’x8’) Icelandic tents which have plenty of room for all your gear and sleeping: bags. Each Icelandic will .be looked after by one of the Assistant leaders and each day in turn, one tent (4-5 boys) will be responsible for all the cooking, washing up carrying water for the whole day. Your 'duty day’ will come round every five or six days and between duty days you will be free to do what you like, while someone else does the cooking and cleaning. If you would like to bring your own small tent for small expeditions away from the main camp, then that will be fine. The SHS provides everything you will need for the expedition. We provide food, camping equipment, tents, plates, cutlery etc. etc. There is even a "hose pipe to bring water to the camp and calor gas driers to dry out clothes if you get wet. In addition we will have four canoes, climbing equipment, project gear for natural science projects and an 8 man inflatable boat with a powerful engine for fishing, boating and as a rescue boat for the canoes. Don't worry if you can't canoe or climb or sail or fish; we don't expect you to be experienced and will have assistant leaders along who can help and instruct you if you want. Attached to this circular is a list of recommended equipment. I would add little to this, but say that if you want to economise you could omit the rucksack and bring a carryall instead. But I would not recommend that you save any money in buying. boots or a good sleeping; bag. If you cannot afford a down sleeping bag (and I know they are very expensive) bring alone a terelyene one and a good thick blanket as well. Even in Summer the Scottish nights can be quite cold and you should have plenty of warm clothes. Mingulay is a very remote island. In the unlikely event of an emergency, it would normally be very difficult to got a doctor to the island. As a result the expedition will have a doctor on it and we are taking a powerful radio transmitter for emergency contact with the coastguard. If necessary a helicopter can be landed on the beach to take off injured people. Naturally we do not expect such emergencies but I include this information to set you minds at rest. Should there be- an accident, we have made plans to deal with it. As far as post is concerned, it will be possible for letters to reach the inland on the boat which brings our fresh bread and. I will give you the address for the expedition in the next circular. These are important. Before you come you must have had a course of three tetanus injections which your GP will be able to give you. In addition, the nearest dentist to Mingulay is over 90 miles away, and you should have a check up a couple of months before you go. Incidentally if you have any information which the expedition doctor should be aware of, please write to me so that this can be passed on. In particular he will need to know if you have any alergies and if you are taking a course of tablets just before or while you are on the expedition. The SHS will provide maps on the expedition, but you may like to have your own. The SHS can obtain cheaply, copies of the 1;10,000 map of Mingulay known as 'Parts of NL58 SW, 58SE and 57NE’, and you will be sent an order form for this map to obtain it at a discount through us. Before the next circular I would recommend that you try and find out a little more about the Hebrides and about Mingulay in particular. Perhaps the best single book is 'The Islands of Western Scotland’ by W.H, Murray published by Eyre Methuen, which you should be able to get from your local library. If you are interested in birds, I would strongly recommend you buy a copy of 'Highland Birds' by D. Nethersole-Thompsom published by the Highlands and Islands Development Board at Bridge House, Bank Street, Inverness. This glossy paper back has plenty of excellent colour pictures, and informative interesting text. It is also remarkably good value and the HIDB will be able to tell you the price including, postage direct from them. That’s all from me for the present. There is much more I want to tell you about Mingulay and I will include information about the history of the island, project work we plan to do and give you details of the assistant leaders who will be coining along on the expedition, in the next circular. Complete the travel form and- return it to me by May 7th at the latest. Make sure you have had your tetanus injections and seen the dentist. Go to your local library to get books out on the Hebrides. do on the expedition. I look forward to hearing from you. persuade your friends to join us. Circular Two is going to involve quite a lot of form filling I'm afraid. 2 copies of an address form for your parents holiday addresses. Names and addresses of all the members of the expedition. What I want you to do is read the lot and send me both copies of the form for your parents holiday addresses and the safety declaration form. There are two sorts of rules on S.H.S expeditions- There are safety rules and camp rules. 4. Do not disturb the leader before 9am as he will be asleep. or in the inflatable boats. 2. If you leave camp you must sign out in the signing out book. 3- You may not visit the cliffs without an assistant leader. There now, that wasn't so bad after all was it? I think you will agree there aren't many rules and the ones we have are pretty sensible. But you will find that we enforce the safety rules rigorously. Once again British Rail are causing us some difficulties. However we have now bought all the tickets and final details of travel will be sent out in Circular Three, a week before the expedition. Nick Deeley:- I'm a Biology teacher and this is the 8th S.H.S expedition I have been on, and the fourth that I have led, and I am convinced Mingulay is the best place in the whole world. Ben Buxton:- Ben is an archaeology student at Durham University and he will be interested in the past settlements on Mingulay. Alan Howard:- Alan will be deputy leader (ie on days when I'm asleep) and is a geography teacher. The form in front of me says he likes singing camp songs, but I'm not sure what to make of that. He will also be doing; a little climbing and is good at 'Hebridean Beach Cricket’. Graham Kramer:- Graham seems to have been in Norway for the last two months; but he is a hardened expedition goer and interested, in all Hebridean wild life and scenery. Hugh Lorirmer:- Hugh is the resident ornithologist on the island and in addition will be the Camp Administrator - i.e. he is the man who decides what we eat each day and runs the camp. Peter and Anne Stevens:- Fishing, canoeing, birdwatching, building camp fires, flying stunt kites - you name it and they'll do it. Matthew Thomas:- Matthew also seems to have been in Norway for the last two months but on the expedition he will be interested in the birds and animals or the island, and be in charge of the climbing. In the last circular I told you of the canoes and climbing equipment we were taking and of the project equipment. Since then I have developed a passion for kite flying, especially the two line stunt kites and I shall be bringing materials along so we can make kites. In addition I have some manual traps so we can trap the field mice of the island and do a count of the population. Ben is planning a survey of an Iron Age site on the island and a survey of the old village. As you can see there will be a lot going on and its up to you to join in! That's all from me for: the moment. Please return your forms pronto, and write if you have any questions. The next circular will arrive about a week before we go. Well there is very little time to go now and I hope you are ready and looking forward to the expedition as much as I am. In this last circular I have some important information about travel, will tell you which tents you will be in, and give you, details about the Home Agent. Since the first circular was produced, British Rail have altered the plans which we made. In return for giving us very cheap party rate travel they insist that the passengers with sleepers must travel on one train, and those without sleepers travel on another. This means that the expedition will be split on two different trains as far as Glasgow. From there onwards we will travel as a group. The non-sleeper passengers will travel on a train starting from Euston at 22.15, this train is called the 'A’ train. Passengers with sleepers will travel on a different train, starting from Euston at 23.00, and go non-stop to Glasgow- This train is called the 'B’ train. All the sleeper passengers will get on the 'B’ train at Euston, whereas the non-sleeper passengers will be boarding the ‘A’ at various stops between London and Glasgow. These people will arrive at Glasgow Central at 07-03 Wed 23 July. This train will arrive at Glasgow Central at 05.22 Wed 2Jrd July. At Glasgow the two halves of the expedition will meet at 07.10 before moving to Glasgow Queen Street to continue the journey. In order to get to London, some 'B’ train members will have to catch trains there from their local stations. 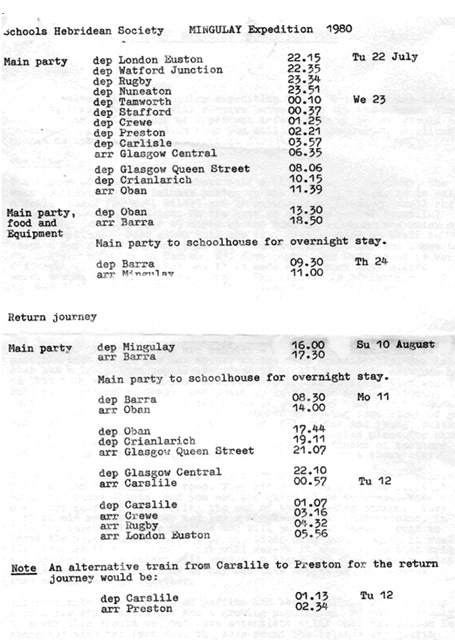 Details for these people's trains and all travel arrangements are summarised on the attached travel sheet. Lastly, would everyone write to me, telling me how they are getting from their home to the station for the outward journey, and from the station back home at the end of the expedition. All the 'B’ train sleeper passengers must assemble in the foyer of Euston Station by the main bank of telephones between 22.00 and 22.15 on Tuesday 22nd July. Vince Giavarini and Alan Howard (Deputy Leader) will be there to check that everyone arrives and put people onto the right train. Graham Kramer and Tony Robinson ('A’ train non-sleeper) will meet at the same place but at 21.30. I shall be travelling on the 'A’ train from Stafford and will meet all the members of the train as they board it. The first meal which we will be able to provide will be Supper on the evening of Wednesday 23rd July on Barra. 'A’ train passengers should bring sandwiches for Wednesday and 'B’ train passengers should either do the same or buy breakfast in Glasgow Station. There will be sandwiches and tea/coffee available on the train from Glasgow to Oban, and meals and snacks can be bought on the ferry from Oban to Barra. ** Please note that I will hold all ferry tickets and these will not be sent to you. Although there are no shops on Mingulay (in fact there are no roads!) you may want to buy meals, chocolate or refreshments on the journey, or buy a souvenir, and will probably need some pocket money. I would think that £6 would be sufficient and £10 would be ample. On the expedition, I will run a bank if needed to keep valuables and train tickets safely. The SHS's home agent is available 24 hours a day for contact with the expedition. He has details of all the travel arrangements, and knows how to contact the expedition if necessary. I must emphasise however that this is an EMERGENCY ONLY link. It should not be used lightly, as to contact the expedition will involve use of the coastguard emergency radio frequency. Ordinary mail will be delivered to the expedition each Sunday by visiting boat. (Does Mingulay have the only Sunday postal delivery service in Britain?) The address for the expedition was given in the last circular. The name of the home agent and details of how to contact the expedition in emergency are given on the attached home agent sheet. Keep one copy for yourself and give the other to you parents for safekeeping. Although we have chartered our own private boat to and from Mingulay, it is important to realise that if the weather is bad we will not risk the crossing. On the outward journey this is not important because we would stay on Barra until the weather was better. At the end of the expedition however, it is just possible that we might not leave Mingulay on the day stated. In the unlikely event of this happening, we will alert the Home Agent of the situation and he will contact your parents, letting thorn know when we are likely to leave. We will then deal with any complications involving travel, and inform your parents when you will be home. I hope you understand that Mingulay is a very remote island, and we must make plans in the event of this unlikely situation arising. There are a few other items which you may want to bring to Mingulay, if you have any musical instruments (penny whistle, guitar etc) please. bring them along. You might also want to bring a kite, or a small tent and camping stove for bivvies, fishing gear (sea fishing only) or two way walkie talkies if you have them. On the last Saturday we will be having the Mingulay ball - a gala occasion with fine food and entertainment Perhaps you might like to bring some fancy dress (bow-tie, clean shirt or whatever) and you will have to dress up. That's all from me, remember to send off your forms and details of how you are getting to the station. See you very soon for the best holiday you'll ever have! 29/07/2013 - I have just been sent this by e-mail from Steven Walker, thanks for this, it all helps to build up a picture of the expedition and the S.H.S. My name is Steven Walker (No. 22 in the photo), my mate Tim told me about this photo of us all, so I thought I would check it out. Firstly, may I send my sincere condolences regarding Nick Deeley to his family and members of the S.H.S. My memory is a bit sketchy after 33 years since the expedition. In 1980 my friends Tim, Rozzie and Quen who asked me to come along on this great adventure, told me about Nick – all good stuff too. They first introduced Nick to me on the train up to Glasgow. Then onwards for this 3 week trip of a life time. And what an adventure that was. I will always treasure and have often thought I would like to maybe return one day again. I still see Tim and Rozzie quite a bit. Other friends on the trip with us where Franky and Titch who I haven’t seen for quite some years, the same with Quen. Also, Ricky Warhurst (No. 2 in the photo) who sadly passed away last year. Very briefly I remember the trains up to and through Scotland to Oban, then a ferry to Barra. The day after a fishing boat took us all to Mingulay with our camping equipment. What a place, felt a bit like Crusoe's Island, except with one house where the owner was actually present and at home to the delight of the leaders who gathered into the house of an evening, maybe for a wee dram. Daytime we played jumping off the sand dunes, went canoeing, swimming, (it was quite hot most of the time) and rock climbing with Mathew our instructor, a very knowledgeable pleasant chap who I recall seemed to have very muscular calves. Back at camp after supper we played footy and a bit of cricket and I was dared by my mates to do a streak across the pitch, seamed to be the rage back then with Erica Roe and the likes. I was a bit daft then so took up the challenge just for a laugh. I recall a supply boat was arranged to bring us bread and supplies but didn't turn up so we all had rations and were pretty hungry. Some leaders and a few lads went out fishing and brought back loads of fish, a flat type fish we grilled in a bit of butter. This was shear bliss, beautiful. On another day me and a few others went fishing in the big dingy out in the bay. It was a hot sunny day, sea was like a mill pond in calmness, aqua blue waters crystal clear. We didn't get a single bite for about half an hour, then we heard a splash and saw big ripples in the water about 20 meters away. So we decided to throw our lines in towards the splash and joked with one another " what would you do if that was a shark" we’d real it in if it was, we joked. We started to hum the theme tune to Jaws and low and behold a sharks fin popped up out of the water! Bear in mind this was soon after we had all watched the film. Quen was even wearing the T shirt. Well, we all absolutely cacked ourselves and thought the shark would tip the dingy and eat us. Anyway it came towards the dingy and then its fin dipped below the surface just like in the film. We all thought we were doomed. The shark was on my side of the dingy and I got a clear view of it as it swam past just below the surface. The shark was about the same length as the dingy which was 14 feet in length. The fin came back up and circled our boat. Ricky said lets throw someone in to feed the shark and then the rest of us could get back to shore. Poor Franky he started crying but who could blame him. Anyway after it circled the dingy for the second and final time it just swam away to our utter relief. We all returned back to shore and blew our distress whistles, where everyone came. Then we all returned back to camp to discuss our day. We did all sorts of other activities too during our stay on Mingulay, all the leaders and all the lads were a good laugh and great to spend time with. The island is a real gem to see, with the magnificent 750 ft high cliffs, puffins and all in all, a real epic adventure. I was touched to hear Nick wanted his ashes laid there. T’is a very special place. This was the one and only expedition I went on and would highly recommend in doing so to anyone, any age just try and get there ! Thank you for creating the SHS website. It would’ve been such a shame for the SHS and it’s expeditions to fade and disappear in the mists of time. When I did my Google search, I had hoped that the society was still functioning. I was on the 1979 Islay and 1980 Mingulay expeditions. 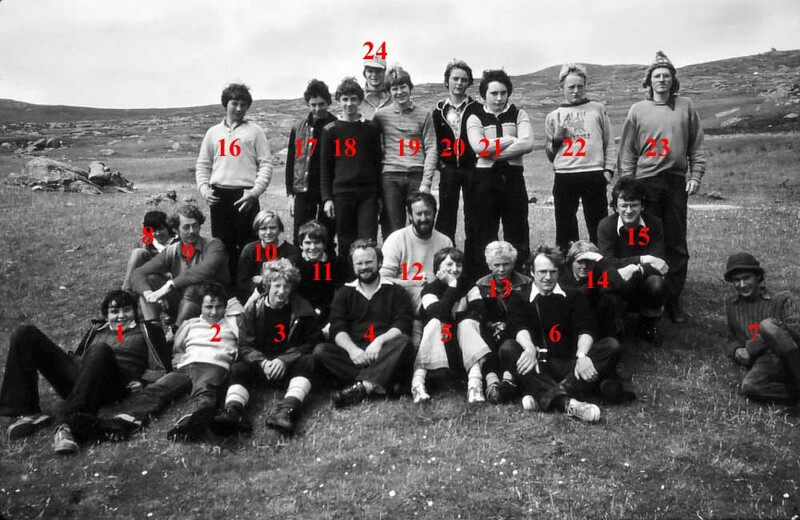 I can help with a couple of names on the Mingulay group photo. After much studying, I think I’m number 5. My friend Daniel Cardinal is number 20, and I think Julian Rake is number 21. I have a few poor quality photo’s, but no scanner. However, if you want I can try and find someone with a scanner and send them to you. Going to the Hebrides was such an amazing experience. We were all so lucky, thanks to the selfless leaders.